A vacancy has become available for an Lead actuarial modeller with experience in actuarial Modelling (Prophet). We are looking for a qualified actuary or an actuary with significant modelling experience from a Life and Pensions background. 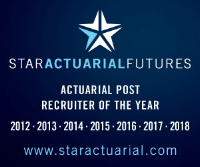 You will be leading a large team of actuaries therefore the duties of the role will vary. We are looking for an actuary will the core skills/experience that is happy to be flexible with the type of work they are carrying out within the business. Preferably a qualified actuary however we will look at part-quals with the right experience. Please if you have any reservations about this role then do not hesitate to give James Knight a call on 0117 312 6710.